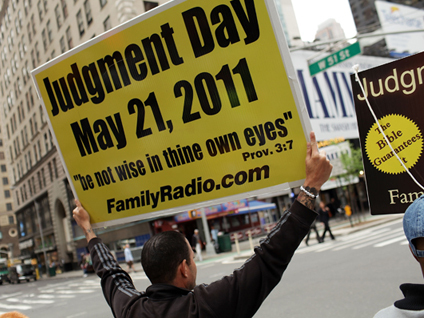 In a prediction getting wide attention, radio mogul Harold Camping says the world will end this evening. And on "The Early Show on Saturday Morning," Rod Kurtz, executive editor of AOL Small Business, said many businesses are racing to get your money before The End. One is called Post-Rapture pet care, co-anchor Rebecca Jarvis pointed out. "Yeah, we've actually seen a number of pet services pop up," Kurtz said. "I guess we could call this 'the Rapture stimulus!' We see this a lot of times with big news events like this." For people who are concerned about leaving behind their beloved pets, Kurtz says these businesses charge a fee to care for their non-Raptured animals. "A lot of these people running these companies are actually atheists who will be around if the Rapture does strike, and they've offered to, across the country, take care of your pets when you're gone. And people are, you know, buying into it. "I think, you know, if you really are worried about this and it helps you sleep at night, at least for the last night ... then taking care of the family dog is priority number one!" Then, there are the companies offering to handle e-mails you want sent post-End. "Yeah<" Kurtz said. "It's, again, usually run by atheists, and they're willing to take your money. Sometimes it's $15 at a time. And you pre-write this e-mail that will go out to a few dozen people that you designate (it be sent to) - other nonbelievers out there who will still be around when the Rapture strikes. "Funny thing is ... last night, I was looking at some of these websites, and they were actually crashing. So I'm a little worried about their plans for Doomsday!" Kurtz say many businesses aim at the End-Times market: "If you Google it, you see hundreds of them. We've seen Rapture Wear, which is a jewelry line. People have been capitalizing on this for years. ... Camping has said this was gonna happen before (he predicted an End in 1994). So there's been a steady buildup of businesses. And, Kurtz said, "They manage to always kick the can down the road if it doesn't happen. This has gotten a lot of publicity, which could be great for business. "The interesting thing is some of the people running these businesses have said that they're donating the money, because they know they're never actually going to have to act on sending the e-mails ... because they don't believe in it."